Exon 1 contains the translation initiation codon. Exons 2 and 3 have been flanked by loxP sites (size of loxP-flanked region: 3.9 kb). Positive selection markers have been flanked by FRT (Neomycin resistance - NeoR) and F3 (Puromycin resistance - PuroR) sites and have been inserted into intron 1 and intron 3, respectively. The conditional KO line has been derived using C57BL/6NTac animals and the Flp-transgene was removed by segregation. 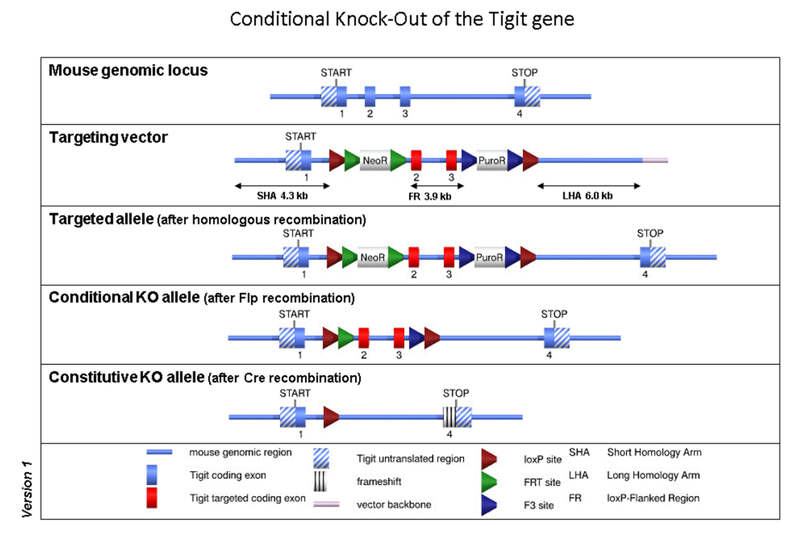 Deletion of exons 2 and 3 should result in the loss of function of the Tigit gene by deleting the extracellular domain (including the Ig-like V-type domain) and by generating a frameshift from exon 1 to exon 4. The remaining recombination sites will be located in non-conserved regions of the genome. Datamining and Design performed 2013.